The AquaFlex Jumpsuit line was developed for bodies in motion and comes in three different thicknesses (3mm, 5mm, 7mm). The suits are made with AquaFlex neoprene, the greatest wetsuit innovation to come along in many years. AquaFlex neoprene has three times the stretch of standard neoprene, which makes the suits easy to get on and off and conform to your body shape. By using the AquaFlex neoprene, Aqua Lung has been able to eliminate the need for ankle or wrist zippers due to the minimal restriction when donning or doffing your suit. This keeps the diver warmer, as zippers are one of the largest sources of water exchange and heat loss. 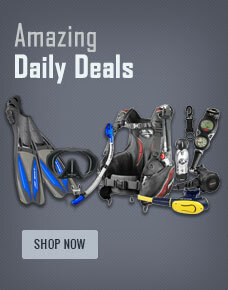 Buy Aqua Lung Suit Aquaflex 3Mm Jmp Men Blk/Char Xl from Divers Supply at the best price. Aqua Lung Suit Aquaflex 3Mm Jmp Men Blk/Char Xl comes with full Manufacturers warranty because Divers Supply is an authorized dealer for everything we sell.